What you eat has a huge impact on how well you can exercise. If you forgo eating before a workout, you’re going to run out of energy and put yourself at risk of injury. If you eat the wrong thing, you might be negating the positive effects of your regimen for the day. 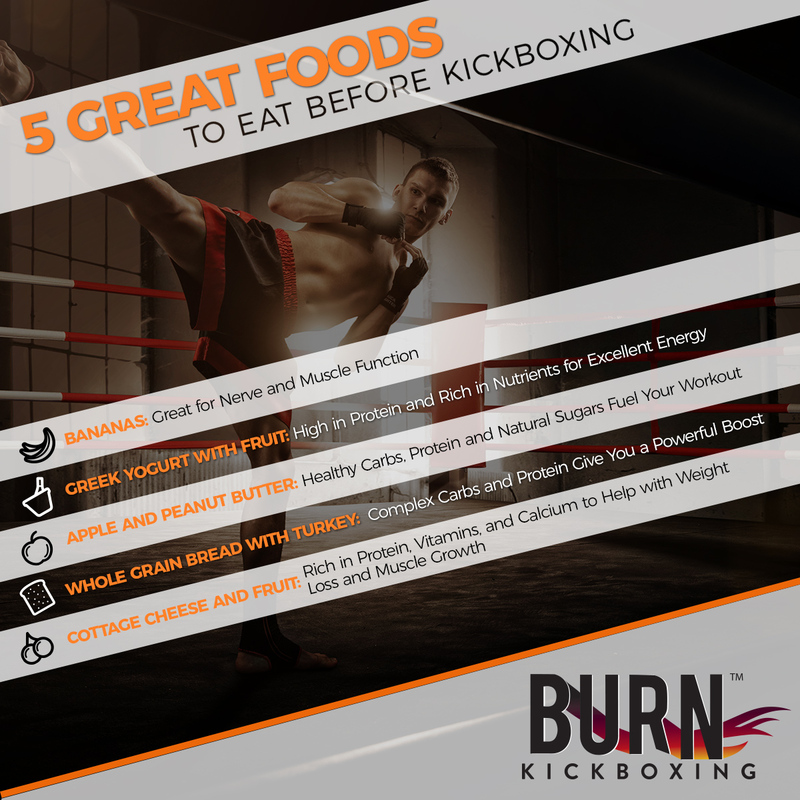 With that in mind, we’ve put together this list of five great foods to eat before you start kickboxing. It’s recommended to eat a light snack, about 200-300 calories, with complex carbs and lean protein around an hour before your workout. Need some ideas? Read on! If you need a place to get a great workout, come to Burn Kickboxing in Syracuse! One of the easiest snacks to take with you and eat on the go, bananas are the perfect pre-workout snack. Packed with digestible carbohydrates and potassium, eating a banana helps your body’s nerve and muscle function, which is vital to a successful workout. Along with that potassium, bananas are a great source of magnesium, which helps protect you from muscle cramps during and after workouts. This is a great snack option thanks to how much you can change things up based on your personal tastes. Greek yogurt has a ton of high-quality protein in it, which helps to power your workout. By adding fruit, you can mix up the taste so you don’t get sick of it while getting the added nutrients and minerals found within your fruit of choice. Experiment with different fruits to see what you like the most. Blueberries and strawberries are especially good, but you can’t go wrong with some pomegranate. Apples contain vitamin C, B-complex vitamins, dietary fiber, and minerals like calcium and potassium. When you combine that with the protein and (good) monounsaturated fat found in peanut butter, you get a snack tag team that’s hard to beat. When choosing your peanut butter, don’t go for the reduced fat version. As we said, the fat found in peanut butter is good, and when they make reduced-fat versions, they replace that fat with copious amounts of sugar, which won’t do you any favors. If you’re looking for something with a bit more substance, go for some complex carb rich whole grain bread. Throw on some lean turkey to get a boost of protein for extra energy. Feel free to replace the turkey with hard boiled eggs if that is your preference. With protein, vitamins, and minerals like calcium, cottage cheese is a healthy and tasty treat. Add in some fruit like mandarin oranges or pineapple to get even more vitamins you’ll need for your best workout. It’s good to keep in mind that cottage cheese does contain a considerable amount of sodium, so it’s best to practice moderation with this snack. When you give your body a healthy snack filled with vital nutrients and minerals, you’ll be able to get the most out of your exercise. Alongside all of these snacks, it’s important that you drink plenty of water to stay hydrated. Are you looking for a place to work up a sweat in Syracuse? Call Burn Kickboxing to learn about our classes today!